Jessica: "Ooh I like that tan sweater"
Jessica: "But I already have so many neutrals, I should get it in hot pink"
Jessica: "Great idea, let's get it"
So apparently I live under this illusion that I am a "neutral" person, true in my head, so not true in real life. While trying to make outfits from neon yellow, cobalt blue, hot pink & cherry red is an exciting challenge, sometimes I just need a neutral to throw into the mix! I am craving all these quality neutrals in my closet - can't you see these packing a punch with the other colorful items in your wardrobe this Summer?! P.S. Many of these items are on sale this weekend! Enjoy 25% your J.Crew Factory purchase with code "HELLOMAY"
Shop J.Crew 25% off too with code "SPRINGBEST"
Get all regular price items BOGO at Gap "BOGO50"
I'm the same way. I look at my closet and pretty much all I see is colour. You really do need those whites, tans and beiges to make it complete! I have a similar mindset when I go shopping. I also think why spend money on a tan blouse if I can buy it in purple instead. Thus a closet with a lot of color and not a lot of neutrals! Loving those sandals!! I love your picks! That necklace is especially lovely. I find neutrals hard to wear, somehow, but I still really love everything you've picked! Haha that is the exact conversation I have too. Rainbow Brite up in my closet lol. That first sweater is amazing! I'm all about neutrals- they go with everything! Those sandals are adorable! love, love that first sweater!!! I love neutrals. I have a feeling that if I bought that baseball sweater, I would wear it a majority of the week. Loving every bit of it. Gorgeous finds. Yesss, adding something colorful would be lovely...or just leaving it neutral. Cheers. That baseball tee is amahzing! And definitely add more neutrals, you never know when they'll come in handy! 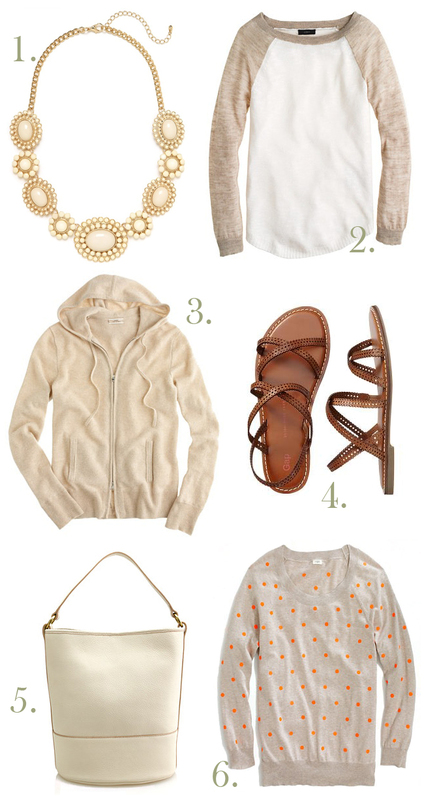 I'm obsessed with that J.Crew linen top- its slouchy perfection! I agree- you can never go wrong with neutrals. I really really want that baseball sweater!! i love it!!! Ok, OBSESSED with that baseball sweater! I am a color fanatic, too - sometimes I just feel like I need to tone it down! These pieces are perfect! I have the exact opposite problem! I have WAYYY too many dark/neutral colors and that needs to change! I find I look best in bright warm colors such as pink, red, coral, and yellow. I have way too many blue, brown, and grey items! this #2 sweater is gooooooorgeous!